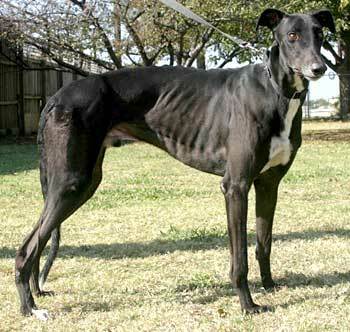 Boomer is a handsome, 3½-year-old black male born December 19, 2005. His sire is Jimbo Scotty and his dam is Esteem. Boomer's litter was not registered with the NGA, however he is the E pup in the litter. 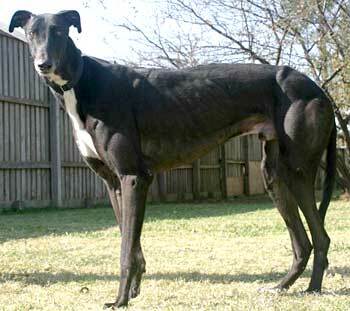 Boomer originally arrived October 23, 2007, with a previous broken leg that had not been surgically repaired, but kept stable in a cast and had healed on its own. It does not cause him difficulties on walks or playing in the house or yard. Boomer was adopted, but unfortunately it was not to be his forever home. He is a sweet and very affectionate big boy. Boomer is small dog tolerant but has not been tested with cats at this time. 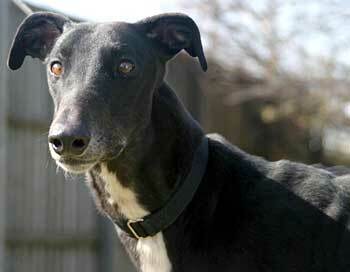 Boomer is a big, loveable boy who would love to live with at least one other dog to show him the way. He is not a shy boy but is somewhat tentative in new situations and could use a buddy to help to give him some extra confidence. He is a happy boy who will greet you with big tail wags and an occasional smile when he is really excited! Boomer likes his crate and can often be found taking a nap in the crate when the door is open. Toys and meal time are two of Boomer's favorite things and he likes to show off to the others how fast he can squeak his toys. When it is bedtime, he runs straight to his favorite spot in the bedroom and waits to get his shiny white teeth brushed. I'm not sure he enjoys this, but he is very tolerant of the process! He enjoys going on walks and exploring the neighborhood and is also a great companion when it is time to relax and just hang out. He will often come and lay his head in your lap so that it is convenient for neck and ear rubs. Boomer would enjoy living in a less active household. He seems to relate well to women and is somewhat tentative around men, but seems to warm up quickly as long as there is a female living in the house as well. 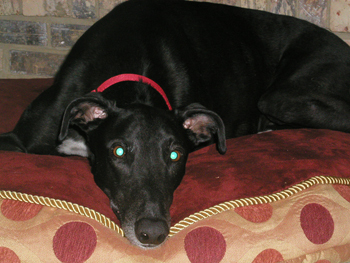 Like all Greyhounds, he will need some time and patience to adjust to his new environment. Come meet this big, sweet goofball – he will make you laugh!